Horton Plains National Park is a protected area in the central highlands of Sri Lanka and is covered by montane grassland and cloud forest. This plateau, at an altitude of 2,100–2,300 metres (6,900–7,500 ft), is rich in biodiversity and many species found here are endemic to the region. This region was designated a national park of Sri Lanka in 1988. Horton Plains is a popular tourist destination, with World's End and Bakers Falls being the key attractions. Travel time to Horton Plains is approximately 30 minutes from Spring Acre. Access to Horton Plains from Spring Acre is by the Nuwara Eliya-Ambewela-Pattipola road. There are railway stations at Ohiya and Ambewela. Transport to Horton Plains can be arranged by prior notice. Horton Plains are the headwaters of three major rivers of Sri Lanka, the Mahaweli, Kelani, and Walawe. The plains' vegetation is grasslands interspersed with montane forest, and includes many endemic woody plants. Large herds of Sri Lanka Sambar Deer feature as typical mammals, and the park is also an Important Bird Area with many species not only endemic to Sri Lanka but restricted to the Horton Plains. Forest dieback is one of the major threats to the park and some studies suggest that it is caused by a natural phenomenon. World's End is a sheer precipice with a 870 m (2,854 ft) drop. It is situated at the southern boundary of the park. Another cliff known as the Lesser World's End of 270 m (886 ft) is located not far from World's End. Baker's Falls, a waterfall formed by Belihul Oya, a tributary of the Walawe River is named after Sir Samuel Baker, a hunter and explorer who attempted to establish a European agricultural settlement at Nuwara Eliya. The falls are 20 metres (66 ft) high. Slab Rock Falls is another well known waterfall in the plains. Horton Plains is located on the southern plateau of the central highlands of Sri Lanka. The peaks of Kirigalpotta (2,389 metres (7,838 ft)) and Thotapolakanda (2,357 metres (7,733 ft)), the second and the third highest of Sri Lanka, are situated to the west and north respectively. The park's elevation ranges from 2,100–2,300 metres (6,900–7,500 ft). The mean annual rainfall is greater than 2,000 millimetres (79 in). Although some rain falls throughout the year, a dry season occurs from January-March. The ground frost is common in February. 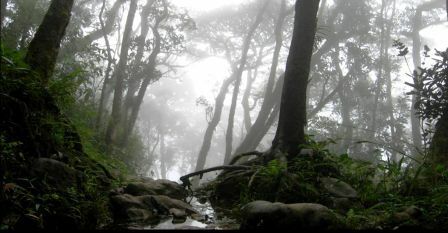 Mist can persist in the most of the day during the wet season. Many pools and waterfalls can be seen in the park, and Horton Plains is considered the most important watershed in Sri Lanka. The Horton Plains are the headwaters of important rivers such as the Mahaweli, Kelani, and Walawe. The plains also feeds Belihul Oya, Agra Oya, Kiriketi Oya, Uma Oya, and Bogawantalawa Oya. Due to its high elevation, fog and cloud deposit a considerable amount of moisture on the land. Slow moving streams, swamps, and waterfalls are the important wetland habitats of the park. The original name of the national park is මහ එළිය තැන්න (Maha Eliya Thenna). But in the British period the park was renamed after Sir Robert Wilmot-Horton, the British governor of Ceylon from 1831 to 1837, who travelled to the area to meet the Ratemahatmaya of Sabaragamuwa in 1836. The vegetation of the park is classified into two distinctive groups, 2,000 hectares (7.7 sq mi) of wet patana (Sinhalese for "montane grasslands") and 1,160 hectares (4.5 sq mi) of subtropical montane evergreen forests. Nearly 750 species of plants belonging to 20 families have been recorded from the park. Species such as Gordonia and Rhododendron arboreum have spread to Sri Lanka, along the Western Ghats of South India from the Himalayas and are now common. Nearly 54 woody plant species have been recorded from the park, of which 27 (50%) are endemic to Sri Lanka. The vertebrate fauna of the region includes 24 species of mammals, 87 species of birds, nine species of reptiles and eight species of amphibians. The Sri Lankan Elephant disappeared from the region in the 1940s at the latest. At present, the largest and the most commonly seen mammal is the Sri Lanka Sambar Deer. Some research findings estimate the population of Sri Lanka Sambar Deer to be around 1500 to 2000, possibly more than the carrying capacity of the plains. Other mammal species found in the park include Kelaart's Long-clawed Shrews, Toque Macaques, Purple-faced Langurs, Rusty-spotted Cat, Sri Lanka Leopards, Wild boars, Stripe-necked Mongooses, Sri Lanka Spotted Chevrotains, Indian Muntjacs, and Grizzled giant squirrels. Fishing Cats and European Otters visit the wetlands of the park to prey on aquatic animals. A subspecies of Red Slender Loris, the Horton Plains Slender Loris (Loris tardigradus nycticeboides formerly sometimes considered as Loris lydekkerianus nycticeboides) is found only in highlands of Sri Lanka and is considered one of the world's most endangered primates. In July 2010 a group of researchers from the Zoological Society of London was able to photograph the mammal for the first time in Sri Lanka. Along with Ohiya, Pattipola and Ambewela, Horton Plains forms one of the Important Bird Areas (IBAs) in Sri Lanka. Together with the adjacent Peak Wilderness Sanctuary, Horton Plains contains 21 bird species which occur only on Sri Lanka. Four, Sri Lanka Blue Magpie, Dull-blue Flycatcher, Sri Lanka White-eye, and Sri Lanka Wood-pigeon, occur only in Horton plains, while other endemic species include Sri Lanka Spurfowl, Sri Lanka Junglefowl, Yellow-fronted Barbet, Orange-billed Babbler, Sri Lanka Bush-warbler, and Sri Lanka Whistling-thrush. Many birds migrate here in winter including swiftlets, and Alpine Swift. Crested Serpent-eagle, Mountain Hawk-eagle, Black-winged Kite, and Peregrine Falcon are among the birds of prey found in Horton Plains. Harriers are among the migratory raptors. This is a key wildlife area. All six highland endemic birds are found here, including Dull-blue Flycatcher, Sri Lanka White-eye, Sri Lanka Wood-pigeon, and Sri Lanka Bush-warbler. Yellow-eared Bulbul and Black-throated Munia are widespread throughout the highlands. Horton Plains was a part of a large system of plains and forest cover that included Agra-Bopats, Moon Plains and Elk Plains. Between 1831 and 1948, it became a Sambar deer hunting ground. Elephants and Wild Boar were also hunted to a lesser extent. During this period lower slopes were cleared initially for coffee and then for tea plantations. As a result, Horton Plains and Peak Wilderness became isolated from other forest and grassland areas. Potatoes were cultivated in the grasslands but planting ceased in 1977. After being declared a National Park of Sri Lanka, these areas were reinstated as grasslands. Tourism-related issues such as plant removal, littering, fires and noise pollution are major conservation issues. Gem mining, timber logging, the collection of plants for ornamental and medicinal purposes, encroachment, poaching and vehicle traffic are the other threats.